Gone are the days when travelling abroad meant dealing with lots of paperwork, dreadful queues, visa applications and unprecedented stress levels – no matter where you were headed. Times have changed, with several countries now offering visa on arrival to Indians. All you need to do is to pick your location wisely, book your tickets and go! India ranks 75th on Passport Index’ Global Passport Power Rank 2018, which means Indians can travel to 24 countries sans a visa and 27 countries offer Indians visa on arrival. Kayaking by a tropical island in Fiji. Visa worries should not deter you from travelling to the serene Fiji islands (no visa required). Fiji boasts of having some of the friendliest people in the world, with the beautiful landscapes serving as the cherry on the cake. The pristine beaches with warm sand and azure water will win you over in no time. Water sports are always an option, should you like to indulge the adventure junkie in you. Sign up for a quick snorkelling session, go kayaking, swim across the coral reefs or just go deep water diving. While in Fiji, make sure to experience the local culture by witnessing the kava ceremony. It is a part of the local Fijian custom where you have to present the executive head of the village you are visiting with a Yaqona (kava root). The ceremony has its set of rules and etiquettes, which the locals will patiently run you through. Fijian cuisine is delicious and you must make it a point to savour some of these delicacies. As for relaxation, you can enjoy the country’s famous banana leaf massage. A rich repository of culture, Jordan is one of the most alluring countries in western Asia. And for Indians, travelling to Jordan is quite easy as the country gives them visa on arrival. The Petra theatre makes for a riveting visit with its ancient architecture still exuding a regal vibe. Likewise, Jerash is a beautiful testimony to Roman architecture outside of Rome. The city has stood the test of time and lures you with its charm almost instantaneously. While you’re there, experience the healing waters of the Dead Sea, wander in Wadi Rum, explore the Dana Nature Reserve, seek enlightenment in the Mount Nebo and go shopping in the bylanes of Amman. Fancy taking a ride to the end of the world? Book your tickets to Ecuador without further ado as Ecuador tourist visa is not required for citizens of India for a stay up to 90 days. While in Ecuador, you can go swimming with sea lions, climb up to the summits of snow-laden volcanoes and stroll through the Amazon jungles. Some of the other key attractions of the country include the Galapagos Islands, Quito, Manto de la Novia, Vilcabamba, Montanita, Banos and Quilotoa Loop and the world-famous swing at Casa del Arbol . If you love ancient architecture, a trip to Cuenca – a UNESCO world heritage site – is a must. It is one of the most beautiful cities in South America. In terms of experiences, riding the Devil’s Nose Train is unmissable. Explore the Otavalo Market to buy some of the local wares and get a taste of the local flavour. Another country which gives Indians visa on arrival is Kenya – and there’s so much more to the country than the most obvious wildlife safari. Of course, wildlife is a big part of African tourism with several animals strolling around the stunning topography. You’ll witness elephants, zebras, wildebeest, flamingos and the African lion, to name a few. The Maasai Mara National Reserve is a must-visit game reserve, housing some of the most exotic wildlife species in the country. Some other options include Amboseli National Reserve, Nairobi National Park, Tsavo National Park and Lake Nakuru National Park. Gedi Ruins, Kitum Cave, Marafa Depression are some of the other attractions you can visit Kenya. Head to the Lamu Old Town to get a glimpse of the local flavour – Swahili architecture, donkeys strolling on the streets, locals decked in traditional attire and more. The Donkey Sanctuary is an interesting place to visit in the Lamu Old Town. Mombasa is another famous town in Kenya known for attracting hoards of tourists every year. The Wasini Island in Mombasa offers exciting water sports facilities. While in Mombasa, don’t forget to pick some souvenirs to commemorate your visit to one of the prettiest countries in the world! 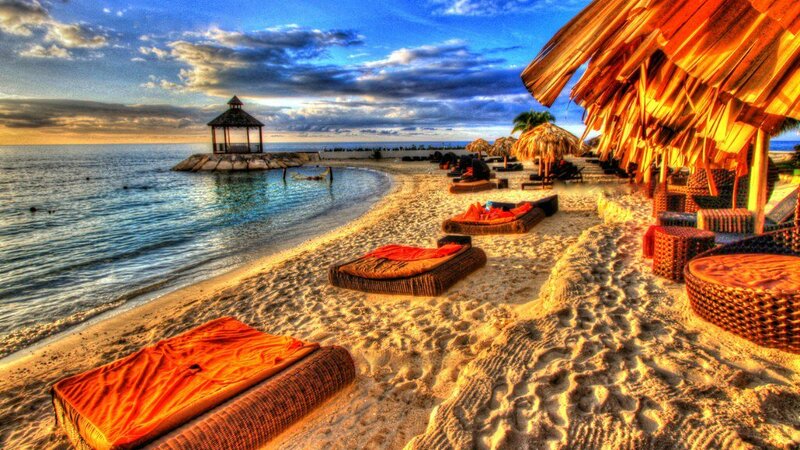 Head to the Caribbean land of Jamaica without worrying about a visa – you don’t need one! Jamaica is full of life, natural beauty and warm people. The beaches are stunning and the forests alluring – and for the uninitiated, this is the land of Bob Marley. Some of the key attractions of Jamaica include Dunn’s River Falls, Martha Brae River, Rhodes Hall Plantation, Rose Hall Great House, YS Falls, Blue Mountains and Black River. Head to Nine Mile Tours, a small town in St Ann Parish, if you want a glimpse into the roots of global icon Bob Marley. If you’d like to know more about the local culture, explore the very famous Montego Bay Craft Market – home to authentic Caribbean artistry.